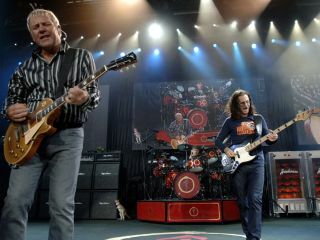 Rush have issued two tracks, Caravan and BU2B, from their upcoming album, Clockwork Angels, on iTunes. And if this pair of aces is any indication of what we can expect from the Nick Raskulinecz-produced disc (recorded in Nashville, no less! ), it's going to be one of their strongest efforts in years. Drummer Neil Peart, describing these recordings on his website, NeilPeart.net, said, "We had never done anything like that before - write, arrange, record and release just two songs, instead of a whole album - then go out on tour and play them, along with what we thought was an inventive selection of our older songs. But the real-time time machine - life - has brought many changes to what used to be called the 'music business,' and we thought, 'Why not?'" Peart added that "the two songs we recorded that day in Nashville are detached from the past, rooted in the present, and pointed toward the future. Because they are the first two parts of what we envision as an extended album-length story, they truly are a work in progress, and thus a glimpse of our own future." The song begins with the sound a train signal and rather ominous orchestration, and then bang! - explodes into a tough, feisty rocker driven by an instantly memorable, gritty guitar riff by Alex Lifeson. At first Geddy Lee hardly sounds like himself. His vocal register is deepening with age - and no, that's not a negative. While he may be backing off from his signature siren-wail, he retains every ounce of force. In fact, at this point in his career, he's becoming a far more captivating and intriguing singer than ever, full of nuance and depth and able to play with phrases in ways that he hasn't in years past. An unruly guitar solo in the middle section segues from a rousing power chord pattern into blazing trills. Underneath, Lee applies fleet-fingered basslines. But what's this? Suddenly, Lifeson fires off runs that are by turns gnarly and spacey. Meanwhile, Peart lets loose behind his kit. It's like Rush in a Cuisinart - which results in a delicious mix. A turgid, vaguely Metallica-ish riff kicks off this badass grinder over which Lee sings, "I was brought up to believe the universe has a plan/ we are only human, it's not ours to understand." But in typical Rush fashion, the song isn't static, and in no time at all it zips into a brisk tempo. Lee's bubbling bass progression suits the mood to a T.
Another mean as all get-out verse follows, and then we're tossed into a bridge of wonderfully atmospheric keyboards and guitars. Lifeson uncorks a brief zinger of a solo - piercing, sustained notes that recall the beginning of his classic Tom Sawyer star-turn (let's hope it's longer on the album version, as this is described as a 'single'). The band hammers the final chorus home in dizzying form. With just these two tracks, Rush prove themselves to be that rarest of bands, one that continues to change elements of their sound rather than chase a proven formula. Bring on the full album! You can download both Caravan and BU2B on iTunes.